I’m always on the lookout for ways to improve the look of my railways. Just recently I came across these fish plates and wow do they make a difference to track work. 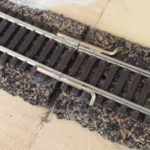 For much of the time, the rails on model railway track look reasonably authentic — especially if using the more prototypical track such as code 75 or 83 (for US model railroads) and wider sleeper spacing. One aspect that always disappoints, however, is the joints between the rails. For most layouts, standard rail joiners are used and while these keep the rails together, and carry the electricity, they’re hardly realistic. On real (prototype) track the rails are held together with plates bolted across the rail ends or, in some cases, with extra wide chairs on sleepers to bridge the joins. The result is that model railway track joints look nothing like the real thing and can ruin the look of otherwise beautiful work. And then I saw the joiners by Proto-87.com. In the photo below, real fish plates are seen on the left, Proto-87’s version on the right. (Click on the picture for a close up). How good does that track look! They sit low on the rails so don’t interfere with wheel flanges and running of the trains and are available for various track codes on HO, 4mm (OO/EM etc) and N gauge track. I’d solder runs of Flexitrack together and then place these at regular intervals along the rails. (Soldering the track keeps the sections of track together and allows the electricity to pass along from rail to rail). Tim from Proto-87 suggests fitting them by cleaning the rails first (to remove grime), sanding the back of the fish plates and rails and then fixing them in place. Finally, the rails and plates are painted and weather pastels added for detailing and the work finished off with a layer of dullcote to hold the pastel dust in place and take any sheen off. It’s a tiny aspect of a layout but one that I think really contributes to the overall believability. What do you think? Model railway track picture from the Piur Freemo module. 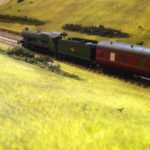 Disclosure: Model Railway Engineer received no money, products or another form of payment directly or indirectly from Proto-87 for this post.